The Chengdu Storyteller Social Work Service Center (CSSWSC) is an NGO which works mainly with girls and youth groups in Southwest China. There is no or little physiological hygiene and sexual education in Chinese schools yet. With their projects CSSWSC want to address this lack of educational programs and work around cultural taboos in rural and Tibetan areas of Sichuan province but also career and study planning projects, self-protection projects or picture book reading. 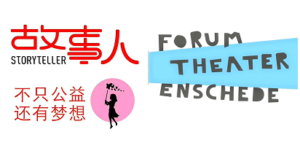 Forumtheater Enschede (FE) is an organization that was created in 2017 as an initiative that wants to address issues from their own environment to provoke social change. FE use theatre techniques and other tools to play games, tell stories and stimulate debate about subjects that matter to its members and might not be acceptable topics in public fora. They include a women’s group which deals with gender identity and discrimination as well as with the specific problems of single mothers.